If you’re new to The Meadows, here’s the low down on this wonderful tradition. The holidays are a fantastic time in The Meadows and Castle Rock, and each year you can join the celebration at The Grange and throughout the neighborhood. This year, The Winter Night Lights Drive will be on Thursday, December 13. Stop by The Grange from 5:30 p.m.- 8:00 p.m. to pick up a map of participating homes and enjoy some cookies, hot chocolate and even pick up free goodies and enter a drawing for some wonderful prizes. 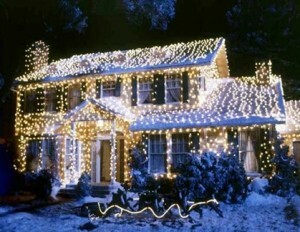 Of course, when it comes to holiday light displays there’s a little competitive spirit inside all of us. If you think your home has the best display, enter your home in the Winter Night Lights Drive Contest, and you could win. Prizes for 1st, 2nd, and 3rd place will be awarded. Winning homes will also be featured on The Meadows Facebook Page. Register your home by December 7th and make sure every bulb is twinkling for judging on the evenings of December 10-12. Register your home here. Don’t this wonderful Meadows tradition. Load up the car and take in the lights! If you’d like to join others in viewing the winners of the contest, you can take the trolley to the winning display. It will be running from The Grange regularly throughout the night. You can learn more about the Meadows Winter Night Lights Drive here. Don’t miss out on one of the most festive nights of the season in The Meadows.